Prithpal Singh Matreja from Mohali, Other Graduate. RESEACH CLINICAL REASEARCH PHARAMACOVIGILENCE ACADEMIC ADMINISTRAT..
are one of expert skill area's of Prithpal Singh Matreja . 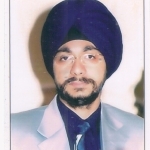 Prithpal Singh Matreja is working in Health Care industry.